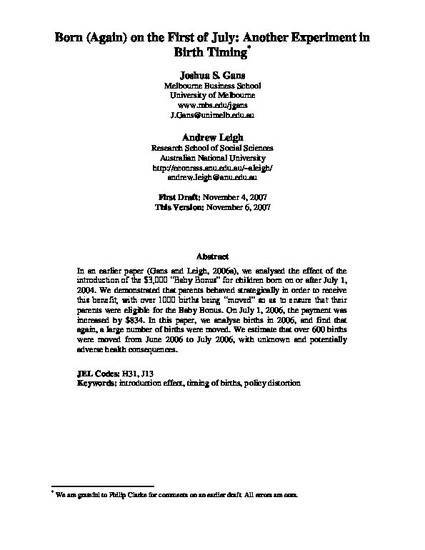 In an earlier paper (Gans and Leigh, 2006a), we analysed the effect of the introduction of the $3,000 “Baby Bonus” for children born on or after July 1, 2004. We demonstrated that parents behaved strategically in order to receive this benefit, with over 1000 births being “moved” so as to ensure that their parents were eligible for the Baby Bonus. On July 1, 2006, the payment was increased by $834. In this paper, we analyse births in 2006, and find that again, a large number of births were moved. We estimate that over 600 births were moved from June 2006 to July 2006, with unknown and potentially adverse health consequences.